Justin Nicholson sent in this one. "This pic was taken on the road one day when we were just a little short of volunteers. 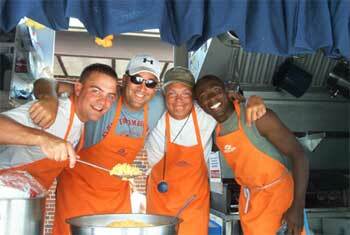 The brass staff actually gave up their own down time and worked the food truck for us that afternoon. The food was pretty good, too -- heh. Thanks guys. From left to right, Ryan Summers (contra tech), Matt Harloff (caption head), Bob Chreste (bari/euph tech) and Andre Feagin (mello tech)." Thanks Justin!